Uganda and Burundi will support Kenya in its current military intervention in neighbouring Somalia against the militant group of al-Shabaab. Both countries agreed on sending troops in order to back “Kenya’s right to self defence, territorial integrity and security of its people” , as Ugandan President Museveni put it, calling the cooperation a matter of regional stability. Meanwhile the UN demands full strength and “the capacity to deal with unconventional tactics of war” from the African Union. Museveni pointed out that the fight against al-Shabaab was not solely a matter of Kenyan interest but rather a regional task, reminiscenting an attack in Ugandan capital of Kampala in 2010. During the final of the football world cup a bomb exploded, leaving 74 people dead and marking the first strike of al-Shabaab outside Somalia. Both Uganda and Burundi provide a total of 9.000 soldiers – the only two countries left in the African Union mission AMISOM I, which is to be expanded by next year with troops from Sierra Leone. The UN demand further involvement from the AU member states. Kenya recently entered Somalia as a reaction to cross-border attacs of Somali militant rebel group al-Shabaab, which increasingly limits the range of the Transitional Federal Government (TFG) in Somlia with its ongoing fight. After initial opposition to Kenya’s intervention in its own territory, the TFG now welcomes the decision. It also receives US military advice. 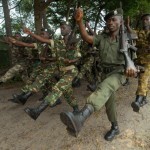 The USA which are already using drones from neighbouring Ethiopia to fight al-Shabaab, are to train troops in Somalia.